Lorcan Otway, who owns and operates Theatre 80 and William Barnacle Tavern on St. Mark's Place, shared the following with us... We first saw him post the details on Facebook. On Friday, just after 4 p.m., three young men attempted to extort $100 from the owner of the theatre, Lorcan Otway, to return a phone they had, which had been stolen from an employee. Mr Otway pocketed the phone and thanked them and said that we did not reward theft. As the three advanced to take back the phone, Otway's wife, Eugenie Gilmore-Otway, a lawyer, snapped a photograph of the instigator of the event, "Mark." He then snatched her phone and the three ran for the door. Lorcan pinned the three against the door, and as they pushed out onto the street, he wrestled away his wife's stolen phone. One of the three, coming up behind Otway, shoved him head first into the Citi Bike racks [across St. Mark's], causing him a head and knee injury." Upon fleeing, the men allegedly hit Genie with their car. She sustained a broken ankle and four breaks to her shoulder as well as cuts to the face. 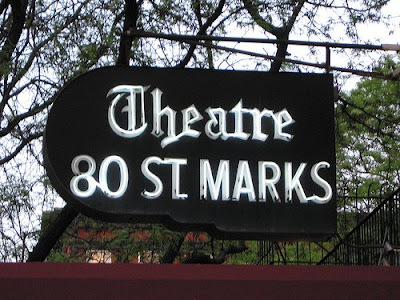 According to Otway, the police have the make and model of the car ... as well as the license plate number, a phone number for "Mark" ... "the staff and management of Theatre 80 hopes for a speedy arrest and settlement of this matter." The sooner they arrest and prosecute these thugs the better! Well it would appear that Mark in quotations is toast. Stand your ground Lorcan. STAND YOUR GROUND!!! The brazenness of these hoods is pretty astonishing. A stay in jail will, I hope, re-educate them as to how one is supposed to live in society. Thanks for checking in, Lorcan. All the best to you and Genie. Your dad was a wise & wonderful man, Larry. I wish you & Genie a speedy recovery and no more of that sort of lark in Theatre 80.